Ice-fishing sometimes is thought of as something that it really isn’t. When the conversation of ice-fishing comes up—and there are people in the conversation who don’t go ice-fishing—their first thought is of how cold you get when you go ice-fishing. And, while it’s true that it requires cold weather to make ice, you don’t have to get cold just because you’re ice-fishing. And, best of all, young people, even those with a short attention span, can really, really enjoy ice-fishing. I relearned that fact on a recent weekend. We had a family with young boys visiting, and all week we had been planning to go ice-fishing, and all week the weather forecast was for below zero temperatures and strong winds. We agreed that a small pond would be the best place for those conditions. Small ponds are usually somewhat protected from the wind, and we wouldn’t need to cover a lot of ice and drill a lot of holes to find the fish. Rex Clark and his dad Dax with a jumbo crappie that Rex caught all by himself. The youngster’s dad, Dax, and I went to the pond, got the holes drilled, located some fish, set up a small hub shelter and got the heat started. We then called mom & grandma and said that they “should bring the guys out”. Fifteen minutes later they arrived and the action commenced. The pond we were on has bluegills, bass, and some perch. We focused on the bass. In cold weather, and for these bass, my favorite bait is a sixteenth-ounce Forage Minnow Jig tipped with a couple of waxworms. This is a single hook bait, and I really prefer single hooks with young anglers. We could get the fish unhooked much safer and more quickly than with a treble hook. Three youngsters started fishing, and all three caught fish quickly. After a while, two decided that sledding sounded like a better idea, so mom and grandma took them sledding. The middle son, Rex, age 7, wanted to keep fishing. We were using spinning tackle with 6 pound test P-Line Floroice on a medium light rod. Rex’s dad lowered the bait and showed him how to see the bait on the sonar. Rex picked up quickly on the technique and soon wanted to do it himself. It wasn’t long and Rex was doing it all. We kept an eye on him, but he was lowering the bait and reading the sonar, and understanding what it was telling him. He was using a Vexilar FLX-20 and telling us when he was going to get bit, and he was usually right. We were catching 12- to 14-inch bass consistently. Not big, but great for a beginner. Rex took big fish for the day, and he did it with no help. He caught a jumbo perch, a true 15-incher. Talk about excited! The weather started to turn for the worse, and we decided to call it a day, although Rex was still interested in fishing. It’s a good idea to end the fishing before beginners ask to go home. There are lots of public and private ponds or small lakes all across the ice belt. We need to get permission to fish the private ponds, and we need to be sure to clean up after ourselves. We can fish the public ponds pretty much anytime, and we again, need to remember to clean up after ourselves. 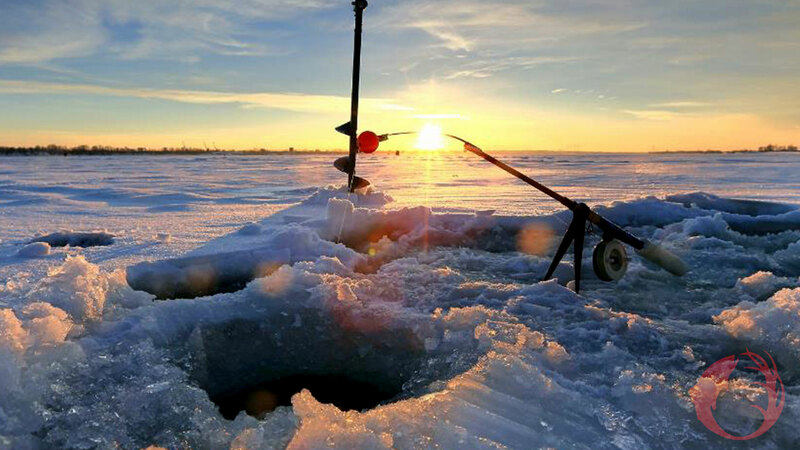 The next few weeks will be outstanding for ice-fishing. The days will be warmer and longer, and as that happens, the fish like to bite. Find out for yourself.